Ready for one on one fight with a sea alien? Here’s the new ben 10 fight game – Ben 10 No Arms Done! Featuring of the one of most powerful Ben 10 alien ‘Four Arms’, defend your ship from the octopus-like alien called Clocktopus having multiple limbs. Ben 10 No Arms Done is a single player ben 10 fighting game where Ben has to face a difficult challenge against a Clocktopus. This game is set on a moving ship when the Clocktopus attacks. You must help Ben 10 to kill the monster before it hurts all the other people on the ship. For that, you need to read the gameplay section below and learn how to play. Recommended: Play Ben 10 Power Splash game online for Free now. This ben 10 game is an absolute time killer and you can play Ben 10 No Arms Done game to ultimate levels (of course until the power ends). To save the ship from the attack of Clocktopus, Ben Tennyson has transformed into Four Arms. Now, you must use the powerful arms of Fourarms to smash the Clocktopus. Hit the limbs of Clocktopus as much as you can to complete the levels. After each level, it attacks become more aggressive and Ben must survive them to save innocent lives! Pro tip: Keep an eye on the Red circles on the platform to predict the next Arm attack. Smash the Arms of Clocktopus to Save the Ship from Sinking and Win. Good Luck!! 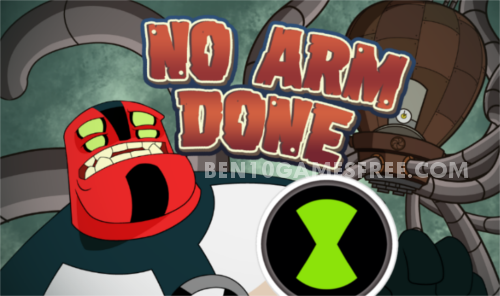 Don’t Forget to give your rating for Ben 10 No Arms Done game and share your tips and tricks to win this game in the comments section below.